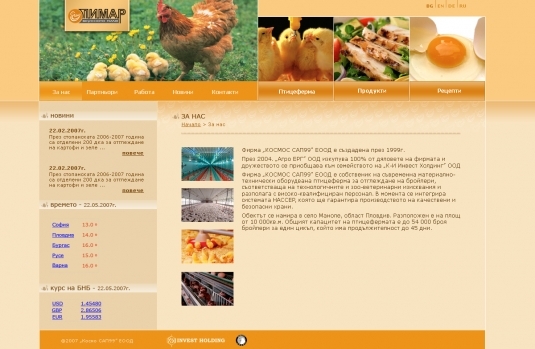 Pimar is a trademark of Kosmos SAP 99 EOOD Company and is a leading company in the chicken breeding and quality chicken goods production. When developing the web site, Corpus Design Studio tried to present properly the quality of the products, produced by Pimar. The web page menus are conformable to the users’ search and the information is well organized. The web site guests will receive information of the company and of the produced goods; moreover special selection of interesting receipts for chicken meat dishes will enrich your culinary skills.